You are here: Home / FAQs / How to merge duplicated contacts? How to merge duplicated contacts? In the case of duplication of contacts (that may be due to, for example, incorrect import or accidentally adding one person/company several times), you can merge all of the duplicated contacts into a single one. It can be done with the use of the merging contact function. You can access it from a person/company profile as well as from the contacts list. Merging contacts means that duplicated instances of the same contact are combined into one. The base is the data from the contact specified as default. All of the data from the other merged contacts will be added to the default contact. However, if there is some information which is not duplicated (like the company’s name), the data from the default contact is saved. On contact’s profile expand the popup menu located right next to Edit and click on Merge contacts. You will see a window in which you can find a contact to be merged with the base contact. If you open the merging form on the profile, Livespace automatically tries to find similar contacts and shows you suggestions on merging them. 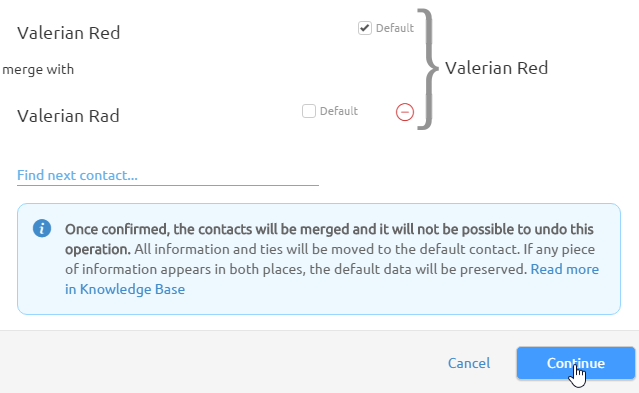 Select all the contacts you want to merge and use the Merge option. Using List operation you can connect up to ten contacts at once. Connecting contacts takes into account all the contact and address information as well as all the information from the additional fields, tasks, deals, entries on the walls, files, and so on. How to remove imported contacts? https://www.livespace.io/wp-content/uploads/2015/10/ls-logo-white1.png 0 0 Joanna Gracz https://www.livespace.io/wp-content/uploads/2015/10/ls-logo-white1.png Joanna Gracz2016-11-30 11:56:432019-04-03 16:06:53How to merge duplicated contacts? How to import contacts from a xlsx or csv file? How to move or copy a Wall post?